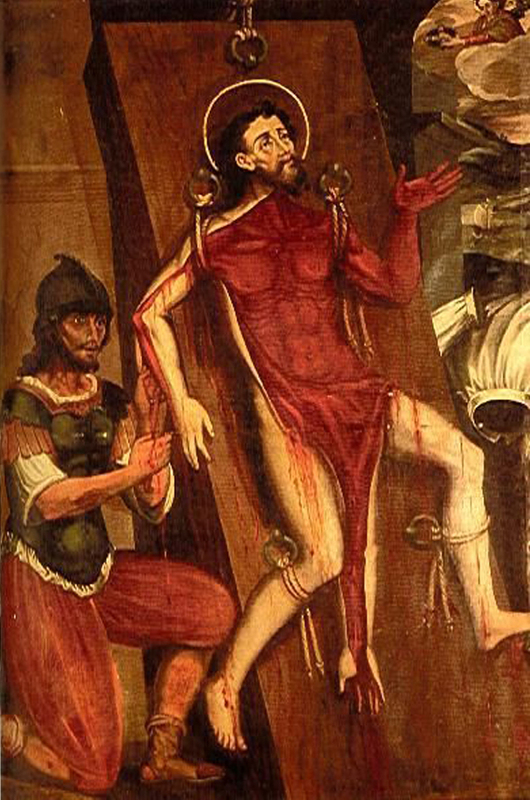 Following is a guest post by Artist and Anatomist in Residence Emily Evans about flayed Saint Bartholomew and his curious afterlife in early anatomical illustration. You can find out more about Emily and her work here. 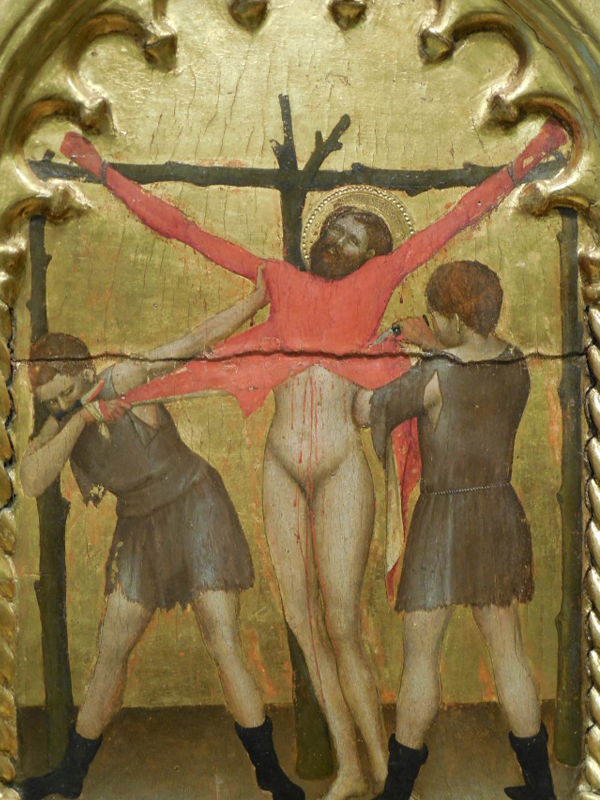 Tradition holds that the apostle Bartholomew was martyred by being flayed alive. This brutal torture has been depicted in many different ways over the centuries. He is sometimes depicted holding the knife, which symbolizes his martyrdom. 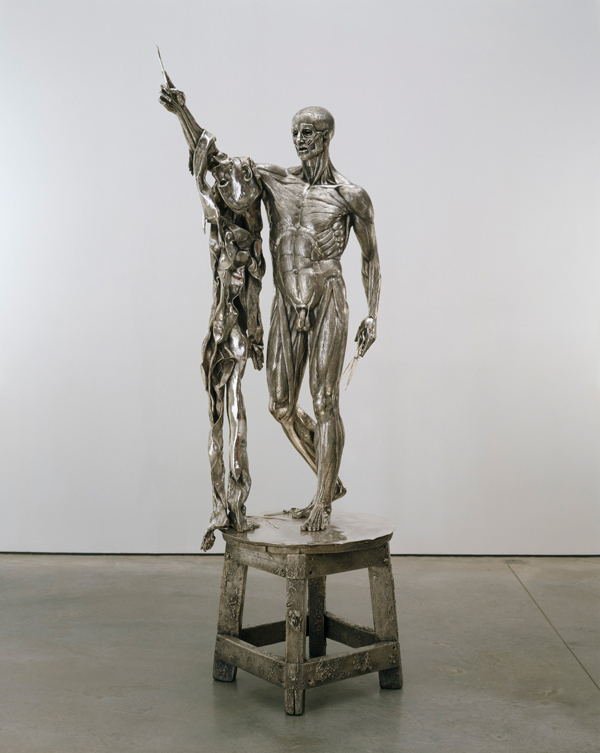 The artworks seem to evolve over time from showing him just before the blade strikes, to when flaying occurs and then in later works after the act, where he is draped in, or holding his own skin. It can be difficult to view these artworks reflecting the act of being skinned alive without squirming thinking of the pain and blood. This is especially so in the early religious paintings of the saint. 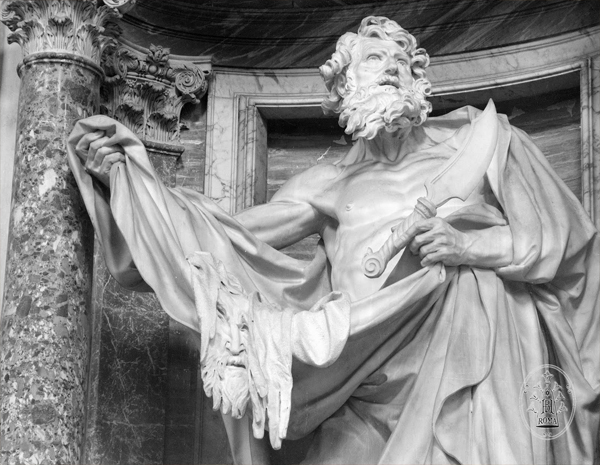 Fine artists took the iconic portrayal of St. Bartholomew to use in their work. 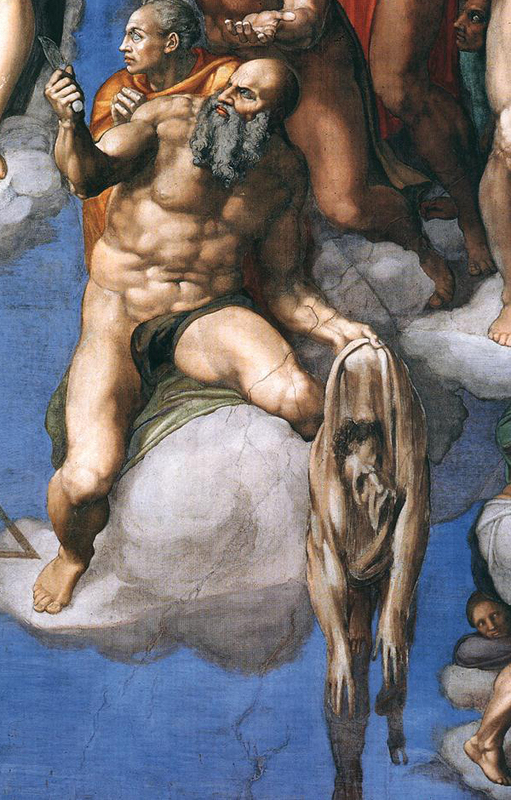 One of the most famous being Michelangelo who included Bartholomew holding a sheet of his own skin in his left hand and in his right hand is a knife in his famous Last judgment, in the Sistine chapel, The Vatican, Rome. The face on the skin is reputed to be a self-portrait of the artist. For the anatomists among us, it’s possible to see past the grotesque barbaric act of flaying to reveal the beauty of the musculature beneath. 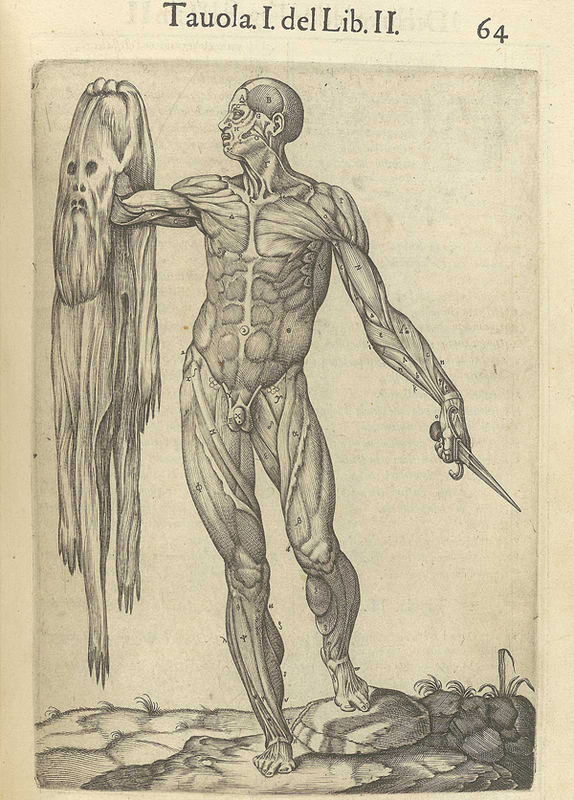 Medical illustrators took this concept and depicted a flayed anatomical man in a more anatomical context than religious one in the famous 16th century anatomical publications. In 1543, Andreas Vesalius published De humani corporis fabrica (On the fabric of the human body). This groundbreaking anatomical tome consisted of engravings which many believe were created by Titian's pupil Jan Stephen van Calcar. In 1560, Juan Valverde de Amusco published Historia de la composicion del cuerpo humano of which all but 4 of its 42 engravings were taken almost directly from Vesalius’s Fabrica. The original illustrations are thought to be drawn by Gaspar Becerra who was a contemporary of Michelangelo, and the copperplate engravings executed by Nicolas Beatrizet. This movement from the religious to the more artistic and anatomical depictions of Bartholomew continued with the sculpture by Marco D’Agrate who was a pupil of Leonardo da Vinci. It begins to become clear how d’Agrate was interested more in the relationship between art and science than in the one between art and religion. ‘The figure was that of a man without a skin; with every vein, artery, muscle, every fiber and tendon and tissue of the human frame represented in minute detail. It looked natural, because somehow it looked as if it were in pain. A skinned man would be likely to look that way unless his attention was occupied with some other matter. 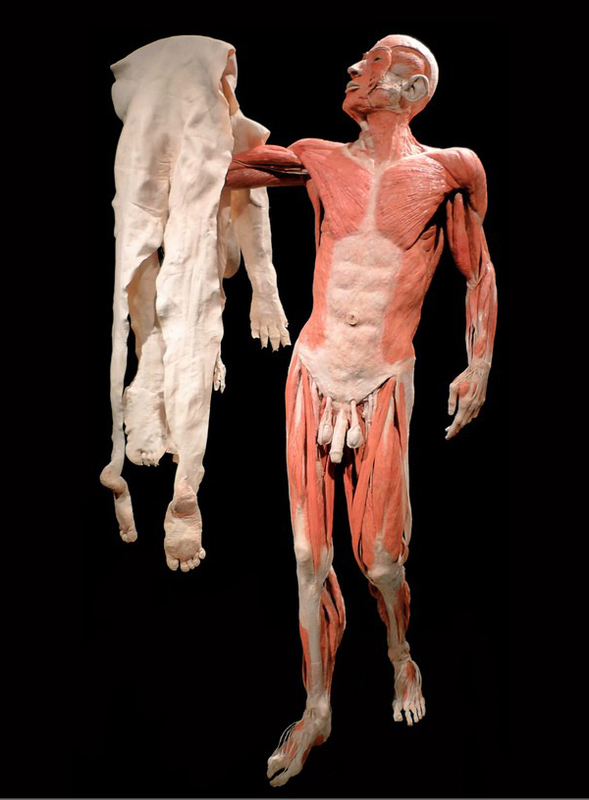 In 2002, Gunther Von Hagen’s Bodyworlds came to London, and I saw ‘The Skin Man’ for the first time. Hagen’s plastination process enabled the first and only depiction of Bartholomew in actual human tissues. Not long after, I saw Hirst’s ‘Exsquisite Pain’ at Royal Academy of Arts Summer Exhibition 2009. This silver edition of the piece stands Bartholomew on a table covered in tools with a scalpel in one hand to reflect dissection traditions and in the other hand he is holding scissors (said to be inspired by Tim Burton’s film ‘Edward Scissorhands’ of 1990). You can currently see an edition in gold at Great St Bartholomew church, London for the next few years. 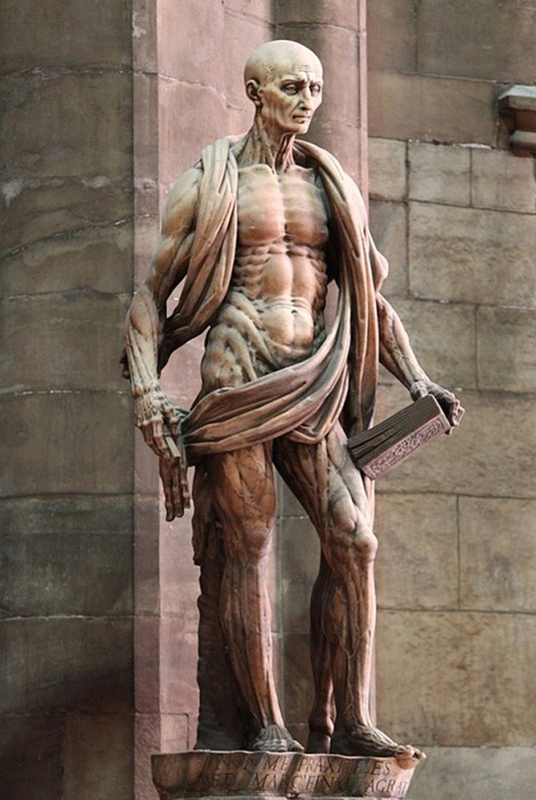 Oddly, St. Bartholomew is also the patron saint of tanners! Fig.3. 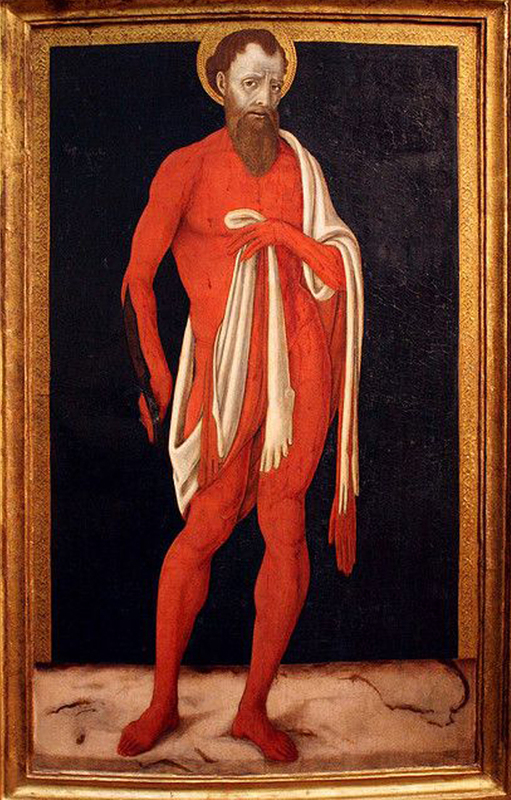 The Apostle St Bartholomew, (1480) Matteo di Giovanni Museum of Fine Arts, Budapest Hungary.